Operatives of the Federal Special Anti-Robbery Squad (FSARS) have arrested a dismissed soldier, Lance Corporal Peter Iwegbulam and two others for alleged diversion of a tanker laden with 45,000 litres of diesel. Arrested alongside Iwegbulam were the alleged ring leader, Ikechukwu Ezekwe, 44, Iwegbulam and the gang’s driver, Olarewaju Darinju. 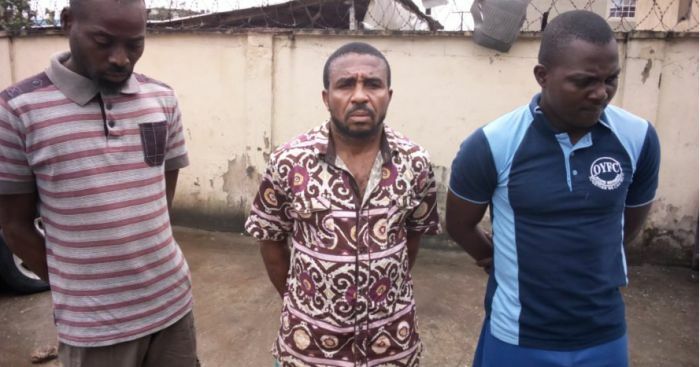 It was gathered that the suspects had hijacked the tanker at Cele Bus Stop, along Oshodi-Apapa Expressway in Lagos and drove same to Ajah to sell the diesel to a ready buyer. The suspects were said to have accused the truck driver, his motor boy, who they trailed from a tank farm at Mile Two to Cele, of being bunkerers and marched them to their operational vehicle, while Ezekwe drove off the tanker. Ezekwe said he had specific instruction from the buyer to hijack a diesel tanker, adding that the client was to pay N130 for a litre. Ezekwe, a father of two, said he was the one who contracted Iwegbulam, adding that he also contacted an unnamed serving soldier, now at large. The ring leader said he planned to collect 50 per cent of the loot and remit the rest to his other accomplices. He said: “This is the first time I will be hijacking diesel tanker. I used to pretend to be a security personnel just to seize petroleum products from vandals. “I initiated the plan to hijack the tanker loaded with 45,000 AGO. I invited this soldier (pointing at Peter) and another one. On the day of the operation, we waited at Mile Two for over two hours for tanker loaded with AGO and not petrol because the buyer insisted on AGO. By the time I sighted the truck loaded with the specified product, I told the driver to move behind it, until we got to Cele Bus Stop, where I took the tanker. “I was already at Ajah, where the buyer who was waiting in his car, drove ahead to the filling station to offload the content. But immediately he sighted the police van that blocked the truck, he zoomed off.